Sorry…. I can’t hear you -Restaurant sound mitigation. Restaurant acoustics are commonly overlooked until the project is complete, when post absorption solutions are the only option. These “fixes” are typically small panels stuck to whatever remaining unobstructed ceiling areas or hung down from wires. These solutions are often ineffective because they are marginal in terms of sound absorption due to their small square footage and additionally are distractive visually. Ideally you resolve acoustic issues during conceptual design and select the various solution depending on what you are starting with VS hoping to solve later when the project is complete. Your acoustical solution in a repurposed gas station will be different than your solution in a strip retail center. One of the simplest and least expensive solutions is a full t-grid with drop in acoustical tiles. If installed high and painted dark it will visually “go away” and can give you 55-65 NRC (noise reduction coefficient) or absorbs 55-65% of the sound that hits it. Anything lower than 10 feet of the t- grid can still be a productive noise reducer but compromises the spatial aesthetic. We learned some time ago to create absorption surfaces first in the process of construction. For example, with typical new construction, we install dark ¾” ridged fire glass panels between the bar joists attached to the metal deck before plumbing, electrical, mechanical or fire sprinkler subs start. Install panels on all the ceiling areas exposed to the guests. Concrete ceilings, brick, drywall and glass walls all reflect sound which, based on the room configuration, can create too much white noise. 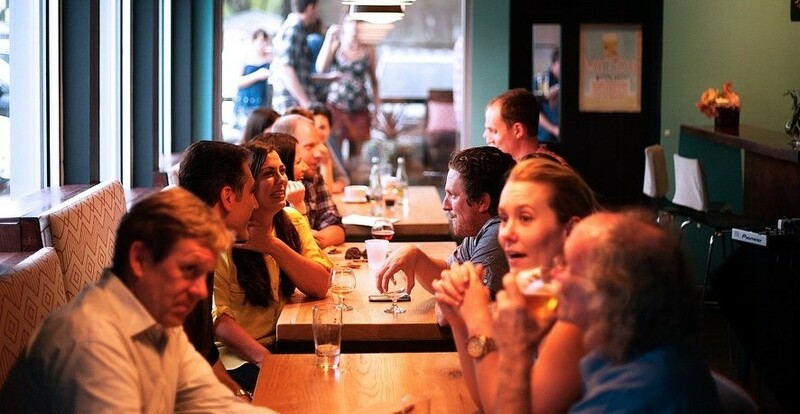 Of course the natural “clatter” of a working restaurant is a good thing, excess however, is the intrusion into an enjoyable evening. It is a myth that carpet absorbs sound, it can though minimize the creation of sound stopping chair noise. Additionally, typical draperies allow sound to pass through them, hit glass and bounce back. 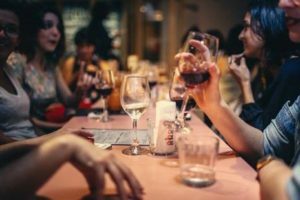 Finding effective ways to absorb excess restaurant noise as early as possible will pay off in terms of pleasurable guest experiences.